Niacin is a water-soluble vitamin also known as niacin. Niacin can be synthesized in the body from the essential amino acid tryptophan with the aid of vitamin B6. However, the conversion from tryptophan to niacin isn’t very efficient because it takes 60 mg. of tryptophan to produce 1 mg. of niacin. 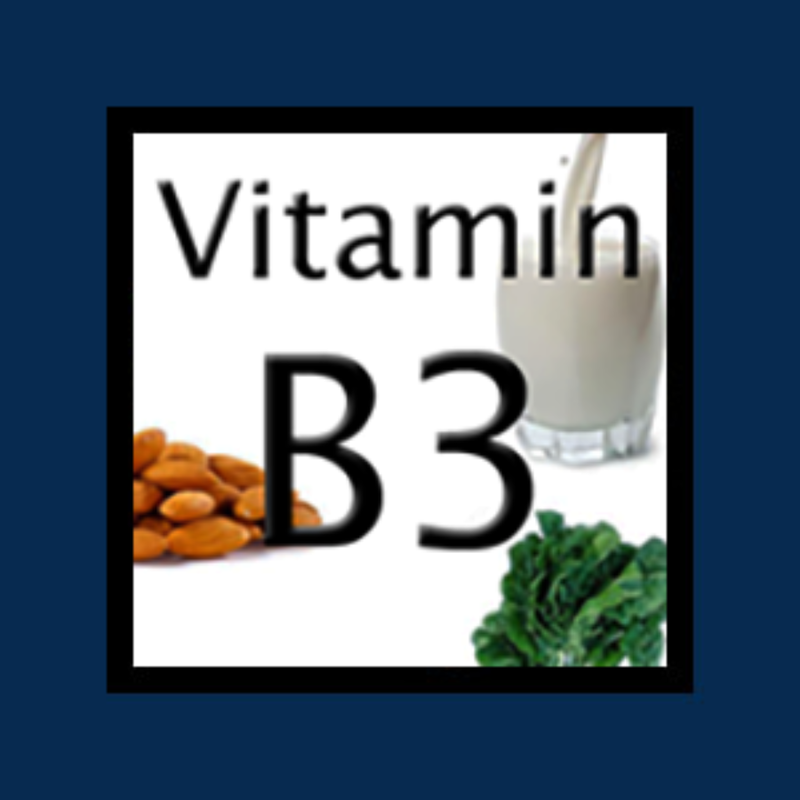 Why do you need Vitamin B3 (Niacin)? Niacin (Vitamin B3), also known as nicotinic acid, is often confused with niacinamide, although technically, they are both vitamin B3. Niacin is vital for over 50 different processes in our body. As with all “B” vitamins, niacin works closely and in tandem with other B vitamins, especially vitamin B2 (riboflavin) and vitamin B6 (pyridoxine). Niacinamide is NOT as effective as niacin in lowering cholesterol. However, both niacin and niacinamide are equally as effective in treating other conditions such as pellagra, schizophrenia, arthritis, and autoimmune disorders. For some, niacin is used as a means of detox. For more information, please see niacin for detox. Niacin, even at high doses, is very safe. Besides the harmless flushing effect, few, if any, side effects have been reported. In some cases however, there is the potential for the elevation of liver enzymes and liver damage. This condition is very rare and most commonly occurs when taking timed-release or extended- release preparations of niacin. (Some people prefer these niacin options to avoid the flushing effect.) Even with the timed-release or extended- release preparations of niacin, high doses of 1500 – 3000 mg can be achieved, and maintained, for long periods of time. Anyone contemplating high dose niacin therapy should have their liver enzymes checked within several months of achieving therapeutic levels (1,500-3,000 mg), especially when using niacinamide and extended release niacin. If you have any concerns with using high doses of niacin, simply ask for a blood test to determine your liver enzymes. Chiropractors, medical doctors and most naturopath doctors can order lab tests (dependent upon the law of the state you live in). What is important to understand is that with any supplement, complications or side effects usually occur as the result of an imbalance elsewhere in the body. For example, Vitamin A, in the form of retinal, gets an unmerited “bad rap” for being highly toxic at doses above 5000 IU. But the truth is that often Vitamin A supplementation is done incorrectly. Vitamin A requires Vitamin D much like calcium requires magnesium in a specific ratio. When this balance is disturbed, side effects may occur. Instead of advising individuals to keep Vitamin A levels to a minimum to avoid toxicity, the public should be educated as to the importance of maintaining the correct ratio of Vitamin A and Vitamin D. The same is true of calcium and magnesium. With that in mind, niacin, being part of the “B” family, works best in conjunction with all of the other B vitamins and Vitamin C. A B-100 supplement is recommended. This simply means that most of the B vitamins in the formula are 100 mg, with the exception of vitamin B12 and folic acid (Vitamin B9) as those require a different ratio so as to be in balance with the other B vitamins. In most cases, any side effect of niacin, aside from the flushing effect, could be prevented by taking it in conjunction with the other B vitamins.